Creative wedding photographer Elizabeth Donovan was presented with the Business of the Year award in The Whitewed Directory Awards from industry expert, and keynote speaker of the evening, Sara Tye. Elizabeth Donovan’s entry was chosen as the winner by an independent judging panel, made up of three highly respected industry professionals, including Sara Tye. She received her award on 1 February 2018 at the Doubletree by Hilton Swindon. Sara Tye is an award-winning business and organisational development expert, a top 500 international PR, and serial entrepreneur. She is the founder and managing director of redheadPR, chair of Swindon Triathlon Club and a top business development mentor. The Whitewed Directory is a definitive directory of recommended and trusted wedding suppliers designed to help customers plan and organise their wedding day. 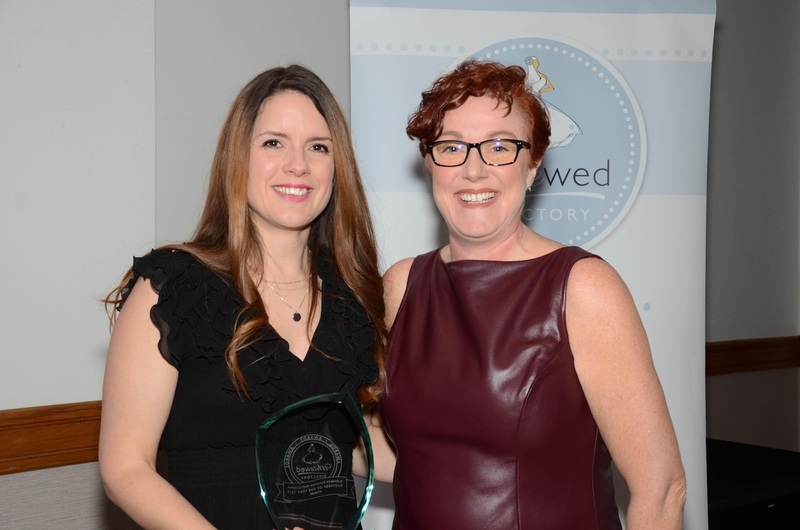 The Whitewed Directory Awards were launched in June 2017 to highlight and support the best wedding service suppliers working in Wiltshire and Gloucestershire. As keynote speaker of the evening, Sara shared her own experiences and her "life long journey". Sara spoke of her inspiration and drive from 15 years old until now, her ups and downs and how she manages her life and achievements. Sara explained: "I was most impressed by Elizabeth's entry. She single-handedly runs every aspect of her business. Not only is she running a successful business, she is also a mum. I know the difficultly of juggling all this and the discipline needed to remain focused and grow a business. Elizabeth has demonstrated that she always goes the extra mile and has an exceptional eye for attention to detail." Elizabeth Donovan’s approach during her six years of trading has been photographing weddings in a natural way. She initially built her customers from wedding fayres but now gets around half her bookings simply through her fantastic reputation among past couples and suppliers she has worked with over the years. Elizabeth has been fully booked for the past four years. Her bookings are boosted by enquiries from online channels and referrals from her professional and information-paked website. This reflects her creative and open approach, including regularly updated blog pieces, supplier connections and search engine optimisation. Elizabeth Donovan’s award was one of four to be presented on the night. Winners were announced for Business Person of the Year 2017, as well as recognition for the Most Inspiring Business Person of the Year 2017 and the region's Start-up Business of the Year 2017.